Ka’anapali One thing that keeps paradise paradise is that we not go in for garishness. Billboards are banned on our highways for that reason. 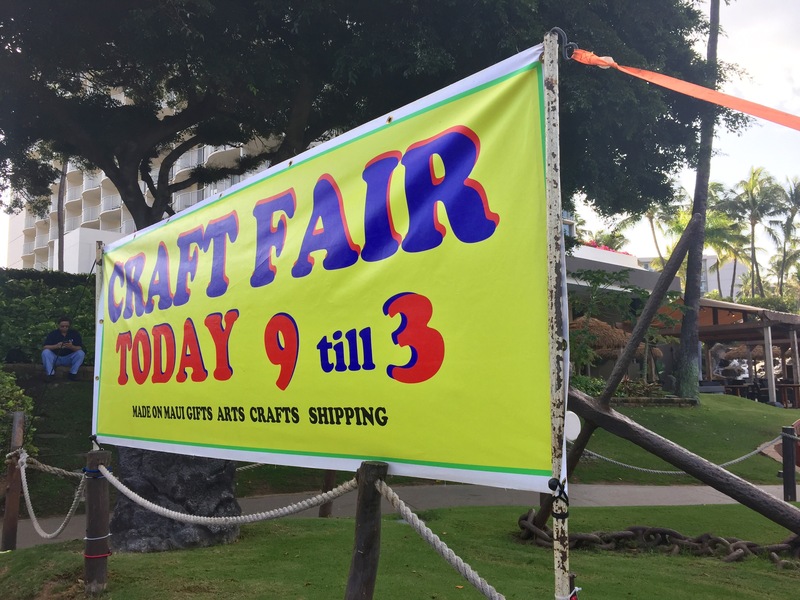 This sign along the beach path advertising a craft fair may well violate Kaanapali Bach Assn. guidelines. Smaller and in good taste would ge the same resut. Another award for bad taste should go to the company that has added a garish japanese tourists bus to our roads. The bus may be appropriate in glitzy commercial Waikiki where it originated but it has no place. VOICES OF MAUI HAS UPLOADED HUNDREDS OF POSTS CELEBRATING KA’ANAPALI BUT SOMETIMES OFFERS JOURNALISTIC-BASED COMMENTARY ON THINGS THAT DESERVE ATTENTION. Previous WHAT HAPPENED 76 YEARS AGO ON MAUI THAT IMPACTED THE USA Fifth provocative photo of the month.